Winter Hours in effect at Staunton State Park! 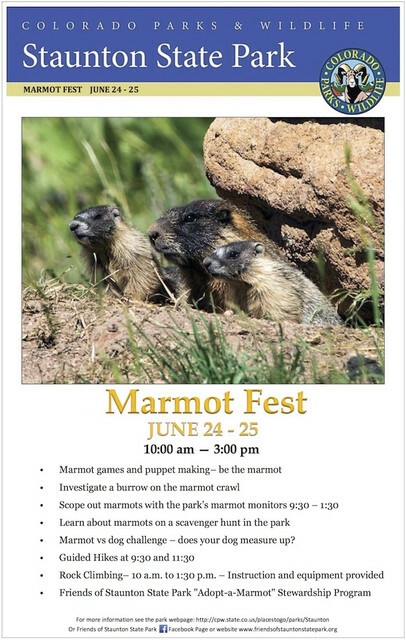 Save the date for the 2017 Marmot Fest! Read more here. See you at Staunton June 24-25! 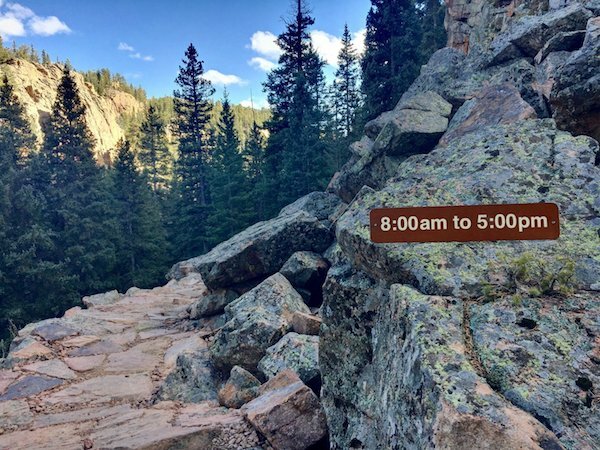 Summer hours are now in effect at Staunton State Park - enjoy the trails, fishing, biking, horseback riding, and climbing between 7:00am and 9:00pm every day! Hours have been extended - Staunton is now open 8:00am-8:00pm! More time to enjoy your favorite park! Staunton's opening hours will extend from 8:00 am to 7:00 pm. daily beginning tomorrow, Wednesday March 1st. Spring is getting closer! Colorado Parks and Wildlife is accepting sealed bids for the construction of Staunton State Park's Service Center Project. The Service Center will be the focal point for all visitors who enter the park. The 4,670 SF facility, located at the main parking lot, will house the park's entry station, visitor services and much needed office space for park staff. Bid proposals will be accepted until 2:00 p.m. on March 9, 2017 at the Colorado Division of Parks and Wildlife, 6060 Broadway, Denver, CO 80216. The hours at Staunton State Park have changed for the winter season. The park is currently open from 8:00AM-5:00PM. Come enjoy the crisp cool air and be sure to dress in layers as the temperatures can vary drastically between sunny and shady portions of the trails, and the weather can change quickly. Passing along from Staunton State Park staff: the current hours of operation at Staunton are now 7:00am-8:00pm. Hours change throughout the season with the next change being October 1st from 8:00am-7:00pm. Have you seen this video about our park?! Narrating is Jen Anderson, our former Park Manager, who guided its opening. With the help of countless wonderful volunteers, the initial generous donation of land to the state by Frances Staunton, and many other wonderful people and organizations giving time, land, and funds, especially Colorado Lottery and Great Outdoors Colorado - GOCO contributing over 11 million dollars, Colorado's newest state park has been operating for 3 years for all to visit! The Davis Ponds have changed quite a bit, and we now have more trails, but the splendid untouched nature remains the same. Enjoy! in the Fairplay Flume's People's Choice Awards. How amazing is that?! Thank you to everyone who chose us as this year's Best Nonprofit in the People's Choice Awards by The Flume - we are honored! We are happy to announce that our 2016 Friends of Staunton State Park calendars have arrived and are available for purchase! You can pick one (or more!) up at the park entrance for $15, or get one from a Board Member - they will be at the Conifer Area Chamber of Commerce breakfast meetings every 2nd Friday of the month and around town. Email Sharon Trilk at to make other arrangements to get one. These calendars make great gifts for friends and clients, and look wonderful in the office or home - we have a limited number and expect to sell out! Many thanks to Brooks Place Tavern and The Software Company, Inc for helping to sponsor the production of this calendar, we are grateful for continued community support of our efforts! All proceeds from the sale of this calendar go toward park improvements. As a reminder to all of you who love and want to support Staunton State Park. The 'Friends' 2015 calendars are available for purchase. The black fox, shown in our Profile Gallery, represents the calendar cover, with each individual month being represented by a beautiful photo taken within Staunton SP. The calendars are available for sale at the park entrance for $15.00. (cash or check) Calendars can also be mailed for $15.00 + cost of postage (US Mail). Please email or call 303.883.0987 for more details. Our calendars make excellent Christmas presents, and are perfect for stocking stuffers and last minute shopping ideas. Give the beauty of Staunton State Park to you family and friends! Our mission is to work in partnership with other organizations to preserve, promote and protect Staunton State Park. Staunton State Park is Colorado's 42 and newest State Park. Only about 30 minutes from the Denver Metro-Area; Staunton opened its' doors May 18, 2013 to a fanfare of patrons, guests and excited volunteers. Friends of Staunton State Park is a non-profit organization designed to raise funds for and provide sustainable growth to the ever-changing facilities at Staunton State Park. It is operated by a Board of Directors who are actively looking to solicit local businesses, promote growth and involvement as well as raise funds for the park and its' future amenities and attractions. Staunton State Park is Colorado's 42nd and newest State Park. Only about 30 minutes from the Denver Metro-Area; Staunton opened its doors May 18, 2013 to a fanfare of patrons, guests and excited volunteers. 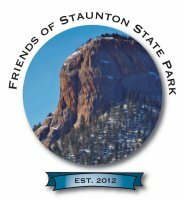 Friends of Staunton State Park is a 501(c)3 non-profit organization designed to raise funds for and provide sustainable growth to the ever-changing facilities at Staunton State Park. It is operated by a Board of Directors who are actively looking to increase our membership, promote growth and involvement as well as raise funds for the park and its future amenities and attractions. All funds donated to the Friends of Staunton State Park are spent on the park; you can see our accomplishments listed on our website. We would love for you to become a member or a volunteer!